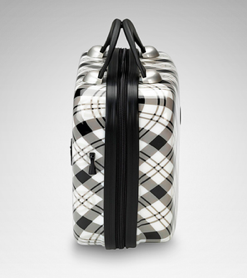 I found this beauty case on ideeli, my current go-to designer sale site. In fact, before I continue, please go there and check them out. I’ve become Super Auntie Lynn to my friend’s children because of my designer baby fashion finds. Sleep sacks for $12, adorable dresses for $15. There are lots of fashion & household finds for women as well. Livie & Luca, that’s all I am going to say because I don’t want you beating me to their sales. Beware, this company keeps luring you back with free credits. So where was I? Back to the Perfect Travel Bag. It’s made by Heys and called the Case. Heys makes all kind of eco-friendly travel bags. I’ve searched all over the web, and this great bag is sold everywhere else for $70. Again, ideeli to the rescue at half price. 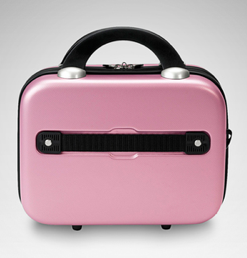 The Heys vCase is more than a cosmetics bag. I can see this as a carry-on turned purse, child’s toy tote or as big girl luggage. The vCase shell is made of that lightweight durable polycarbonate composite just like those ever popular wheeled bags you see all over the airport. The interior is fully lined with zippered compartments and a removable mirror, and an attached strap for hooking your vCase up to it’s big sister luggage. There are thirteen colors & prints with two different finishes, metallic or smooth. I love the faux animal prints and shiny ipod colors. And that plaid, check it out. A visit to the heysusa site reveals a really cool micro scale and Disney kid’s luggage. Their Raku Watch collection will assure you don’t miss your flight. All their products come with a lifetime guarantee. 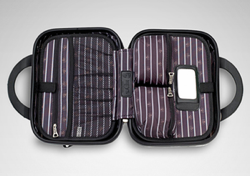 vCase is currently on sale via ideeli for $35, down from $70 retail.